Originally posted by unboundmo: Also... I'm curious... aren't your side panel scoops functional?.. 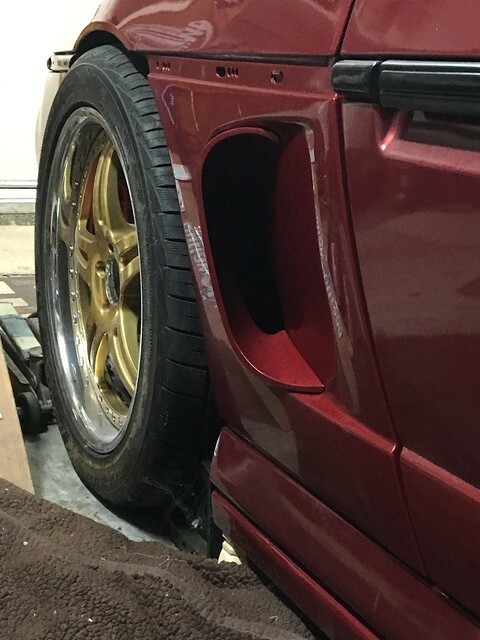 the reason I ask is that I have modded side scoops (both sides of the car) and I mounted a B&M oil cooler with a temperature controlled fan sitting on the passenger side under the battery box in the well area. 8x8 x1-1/2 with fan inches deep, I think. fit like a glove with some little space left over.. the oil filter may fit as well... it works so well!.. why the trunk?.. I had to fab a bracket but no big deal.. I agree, the side scoops are perfect places to put an oil cooler. 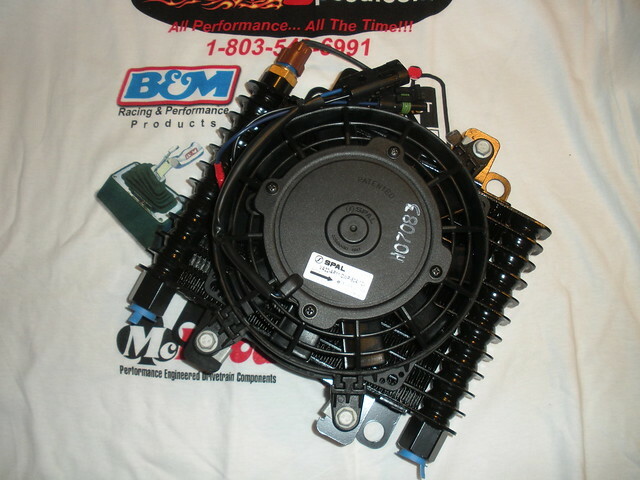 And if your battery is relocated up front, it opens up a perfect place for an oil cooler or intercooler, as well. That said, I'm interested in seeing how Rei decides to mount his oil cooler. Well I'm saving the side scoops for something else but the oil cooler will be replaced with a bigger unit that will have its own fan. The trunk part will be an open space and a rear diffuser will take its place. I'm working on making the entire underside of the car flat bottomed. And the side scoops along with two big NACA ducts in the under plate will be responsible for bringing cool air to the engine compartment. Some naked pics.... :| ... And with a homemade bracket to hold it in place..
With the wheel well installed, it creates an excellent cavity to cup that air. The cooler's fan turns on at 185 and shuts off at 175, keeping it at a good optimum temperature I think... The fan even continues cooling for 30 seconds after the car turns off.. 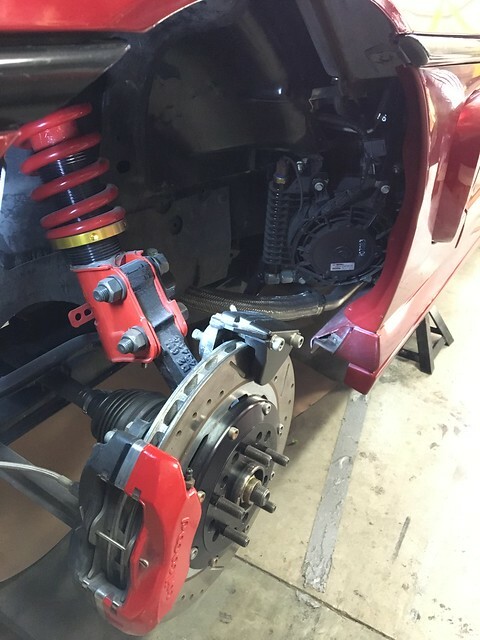 There was a lot of fab work for me.. originally, I had the stage II scoops .. then due to friends having them also, but with the door trim that went with it as a kit.. I wanted to go into a different direction to be original. I refiberglassed the mold to follow the lines of the original GT trim..... then made the scoops to insert.. I don't want to jack this thread though.. I'm really interested in La Fiera's 3.4L hittin 250hp! If I remember right mine is a Mr Gasket adapter. It works pretty good! 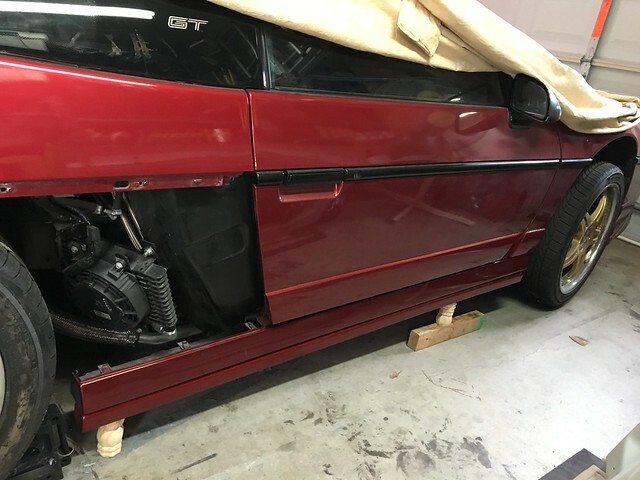 Nice and hidden from the top side..
What engine you got in your car? It looks pretty clean and like mine everything is wrapped on heat shield! I really like the crackle sounds..especially in the supernatural video.. the warm up... were you running a muffler at the time?.. and is it with a catalytic? The 260 and 272 cams are smaller than the one my 2.8. The 260 is 204int/216ext duration @.050 and the 272 is 216int/228ext duration @ .050. I was using the stock fuel pump and noticed it had a hard time keeping up with the AFR so I upgraded to a 340GLH. After installment I had to re adjust the fuel pressure. Now the gauge on the regulator is steady, before it was bouncing up and down and the AFR's are steady. I'm building this car for Time Trials so the next thing will be smoothing out the body for better aero. I want to make it flat bottom. I'm also working on another Supernatural short block to get 300whp with the iron heads that I'd rather not say the displacement because I can already hear all the negativity and harassment, so I'll just do it and show it after its done. Mean time I'll just use the winter months to fine tune this engine and start testing by March. 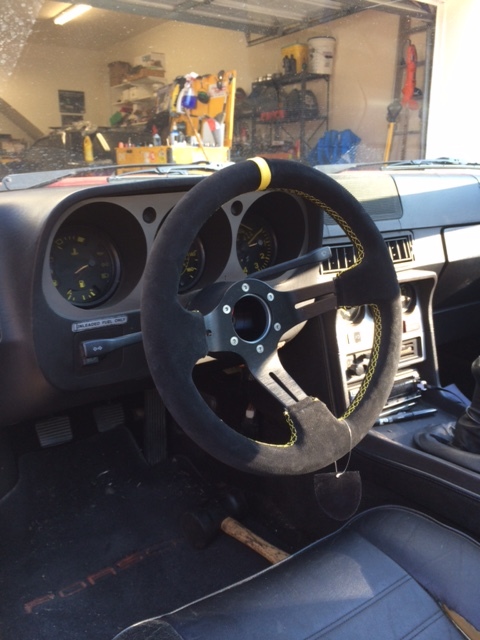 My motto is "If you didn't try, you've failed because failure is the beginning of success"
Today I took a break from the Fiero and installed an upgrade on my '83 Porsche 944, I love driving this sucker!! 128WHP and I can be on the bumper of a Vette through the twisties!! Did someone check the pressure during a WOT run on a dyno? Am I wrong that when talking about octane ---- 87 - 112.... the higher the number, the more delayed in explosion?... not sure if my Dad was right but he always said the higher, the more junk is in the gas to delay the explosion.... so it would be a timing thing to fine tune a certain octane to a certain timing for maximum efficiency?... higher octane, the less advance the timing? Would this be from a not balanced crank? Higher octane doesn't change the burn speed, it raises the fuel's auto-ignition point. That means it takes more temp/pressure to light off the mixture without an outside source (spark usually). 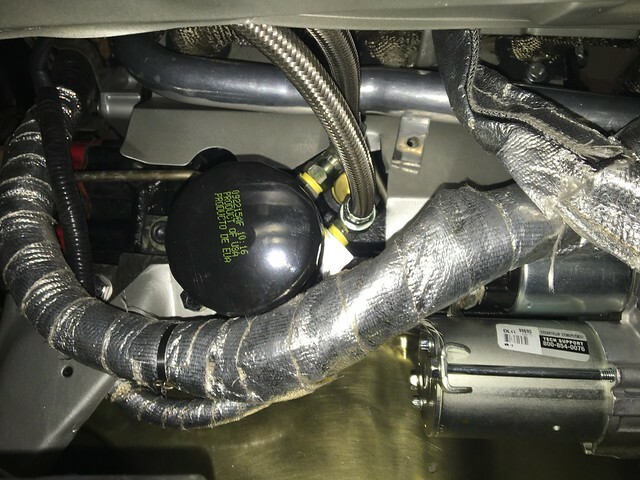 Proper timing is set for the engine's characteristics, not the fuel's. Run what the engine wants, both in timing and octane. I see SBC rods in your future. Did you blow the motor already? How many miles you get out of it? ----does anyone know if there is a guide / chart somewhere that shows what compression is for what range of octane?.. sorry La Fiera for interrupting your thread... some good advise though! Edit to say----- I guess my Dad had it right, in a way.. I was wrong when I started talking about timing..
La Fiera --- talking back regarding that 2.8L.. and the cam.. how is your powerband with your config now.. 10.8:1 and lobe lift.. is the 3.4L have the same .512 lift? Per the chart and your compression.. I don't see any less than 100 octane to be safe?.. no knocking.. not sure if 93 will be okay? No, the first time It bent a rod and I was just driving it normal. I checked the timing table and it was way too advance I made sure I checked everyting and the timing I sincerely forgot! So I took it out and put new rods and crank. Also re adjusted the timing table and is all good now. 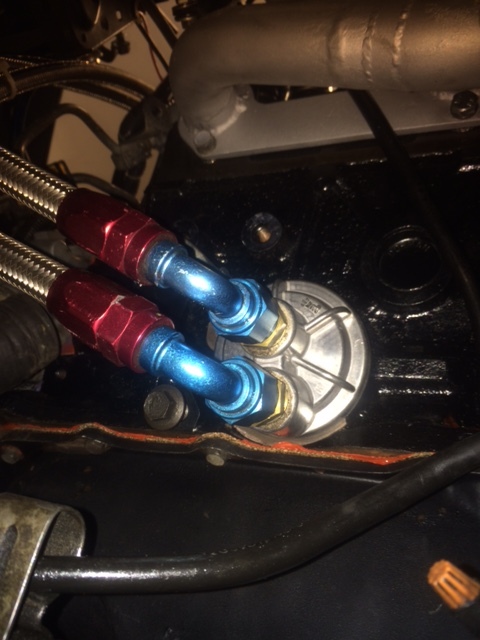 The Supernatural is .533 lift int and ext Right now the engine pulls strong till the rev limiter kckls in at 6400rpm and it gets there pretty quick. I want to try it higher at the dyno so I can see where to set the limiter. I built an iron head 4.3 with 9.9:1 compression and a stock cam (very mild) for my Astro that I ran on 87 octane all the time. It doesn't hurt that I'm at 3000 feet altitude but no problem down at sea level either. It depends on the engine. With good prep and good combustion chamber design etc 11:1 is doable, whereas with a poor design (my old '54 Chev 235 for example) the max compression on 87 would be around 9:1. It gets pretty involved when exploring the fringes and the consequences can be dire, so run a bit more octane than you think it needs until you've thoroughly tested your combo. So quick question...---- I guess I've been the question guy lately😐.. Hey!-- bump to the top! Anyway, what size primaries did you go with here?...... I thought I read somewhere that you were working on them at the time? Are these the new? For the other Y-section picture you posted, that was the old? I can't quite figure how that fits to this header?... long headers a ***** on the firewall side I bet? any pictures ? ..... what muffler is that in the supernatural vid?.. might as well ask that one too... just get it out of the way --- hollowed out goodness to my ears..... I'm getting to think that mine is too mellow now.. but not like I'll atempt to make another system anytime soon. 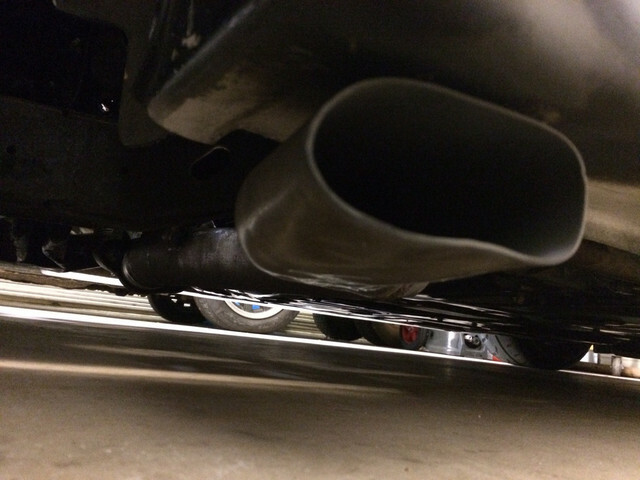 Primaries are 1.5 inches, collectors are 2.24 inches go down to meet a 3 inch pipe, no muffler. This shot is so you can see the Y pipe installed. Its pretty far from the distributor to avoid cooking the ICM. Also if you look at the header on the trunk side you'll see it covered by a shield, I have the same shield on the firewall and I still have plenty of space from the firewall. Here is the exit, a 3 inch pipe oval at the tip. 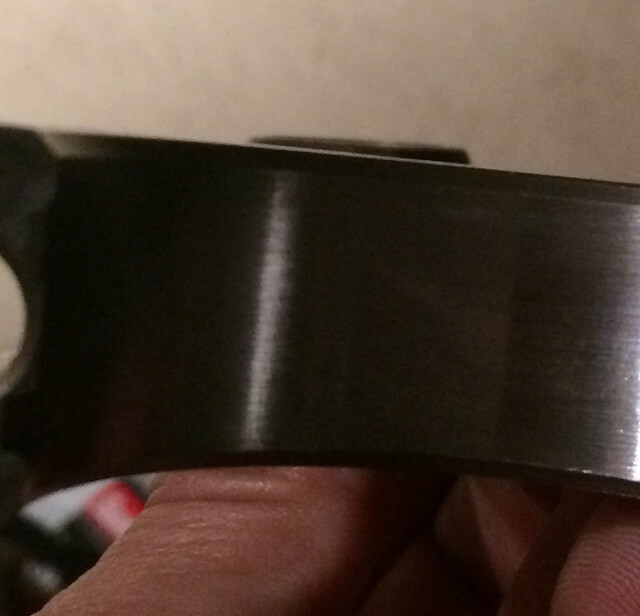 I never had any problems with it, my only complaint is that is a bit heavy because the gauge of the steel is thick. I have the colletors that attach to the Y pipe on a bracket bolted to the transmission that way the headers don't hold the weight of the Y pipe. The 3 inch pipe that serves as the final piece is also attached to the engine at the head, no exhaust part is held at the chassis. "If" the engine moves the entire exhaust system moves with it. The next Y pipe will be similar but it will be exiting on the drivers side made out of thin chromoly steel, so it'll be shorter and much lighter. It is my understanding that changes in valve and ignition timing can allow for lower octane fuel to be used. 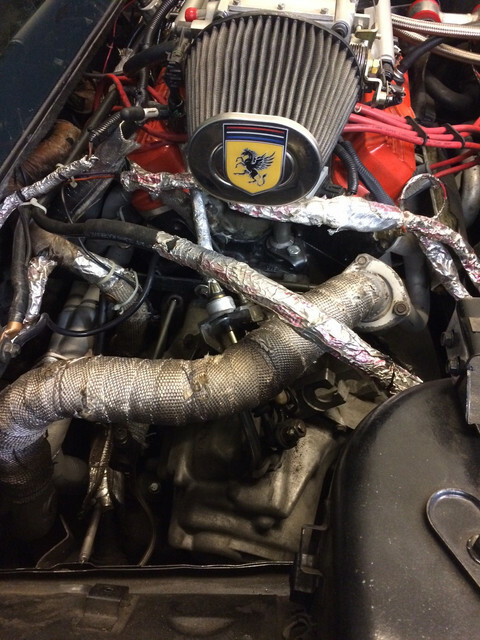 It isn't just compression ratio that determines the octane requirements. Is this correct? You are right. 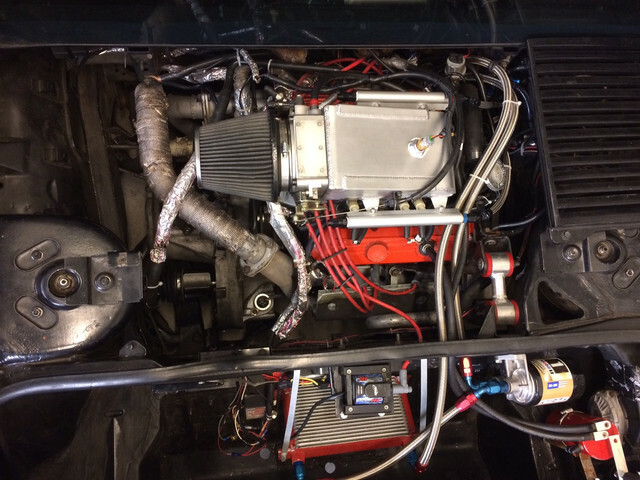 With a motor that has a lot of compression you can install a large camshaft and it will bleed off a bunch of compression and at the same time you can retard the timing to run lower octane with a high compression motor. I use those compression vs octane charts just for reference. Correct. To be more specific, the engine runs on dynamic compression. 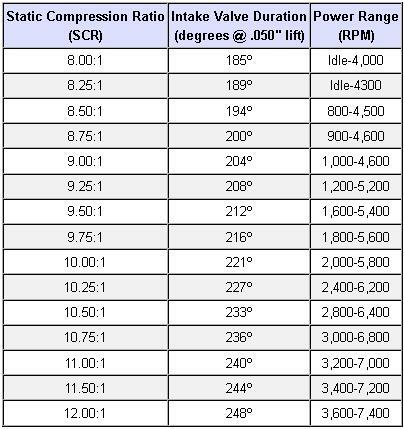 Dynamic compression is basically the static compression modified by the valve timing. So for example, a camshaft with lots of duration will reduce the dynamic compression significantly. 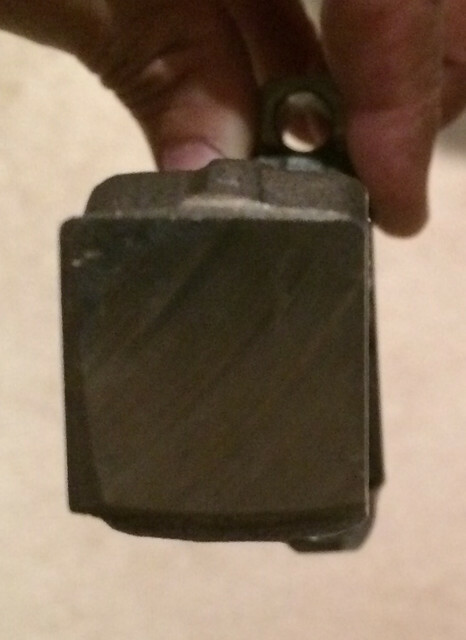 This is why it's recommended to increase the static compression with a high-performance camshaft. Because you don't want the dynamic compression to get too low. As a general rule, more dynamic compression requires a higher octane rating. And vice versa. Although cylinder head design can affect this, as well. 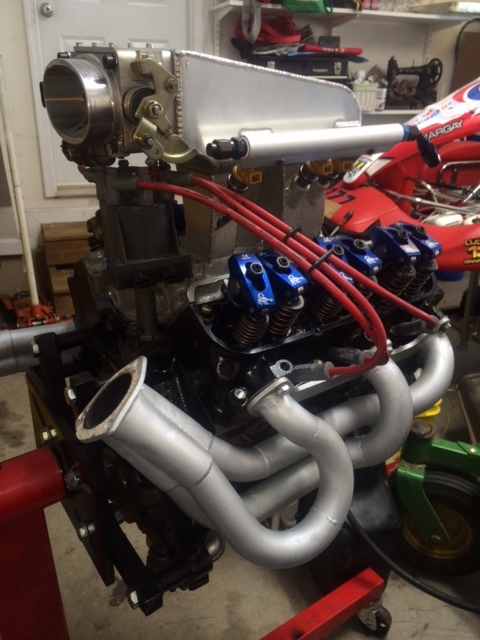 For example, aluminum cylinder heads tend to run cooler than iron heads. So you can use a little more compression, or a lower octane rating, or a combination of the two. Well... it's actually a late intake valve closing event that modifies dynamic compression. That has nothing to do with overlap. More like you misunderstood dynamic compression.